Or a beach connection. A favorite destination was the North Carolina coast, especially the Baptist Retreat Center at Caswell Beach near Wilmington. Caswell, now part of the town of Oak Island, was the site of family retreat weeks for many North Carolina Baptist churches and college student groups. This retreat, with its plain but spacious old homes and then-new ‘motel,’ was a perfect combination of community and solitude. Wake Forest Baptist Church families attended one week per summer and enjoyed taking their friendships along on vacation. There was sometimes a bit of friendly competition for the best houses. Ed also attended regular work-related retreats for administrators held at Caswell and elsewhere at the beach. For Ed, beach conferences were always richer and more productive. He especially enjoyed the retreats organized for the Division of Student Life, with Bill Currin and many other congenial friends. Ed and Jean, with little Carolyn, lived in New York City from 1960-1961, when Ed first attended Union Seminary. They lived in the Morningside Heights neighborhood not far from the Seminary and Columbia University. It was an exciting time at Union, with Reinhold Neibuhr, Paul Tillich and other luminaries on the faculty. They were reunited with Tracy Early, a fellow Southeastern student who had also continued studies at Union. Ed and Jean, in their early 30s, found the city to be a fairyland of friendly people and many new discoveries: yogurt! Chock Full of Nuts! the Automat restaurant! Doctors who made house calls for $10! Carolyn, at age 3, was amazed at the nuns in full habit (“It’s Black Riding Hood!”), the Rockettes, and at the Macy’s Christmas parade where chimpanzees rode tiny tricycles like hers. Ed did his course work but still had time to do many touristy things with the family. In the city, they had a front row seat to the leaders and events of the day, hearing Dean Rusk on the Union campus and Adlai Stevenson at the United Nations. Jean read books, read and typed Ed’s thesis, and audited classes. They had good friends in Charlotte and Don Crosby and Tom and Ginny Derr, both of whom were couples with children Carolyn’s age. Jean’s New York diary of 1961 shows visits to the Perry Como and Ed Sullivan TV shows and hearing Leonard Bernstein conduct in Carnegie Hall. They saw Shakespeare in Central Park and saw the Wake Forest basketball team in Madison Square Garden. They attended Yankees games, saw Wilt Chamberlain play for the Philadelphia 76ers, and attended the Macy’s parade. A steady sampling of Broadway plays included My Fair Lady, The Sound of Music, Young Abe Lincoln, and Becket. One of their favorite outings was to take the Staten Island Ferry and return to Manhattan at night to see the NY skyline in the moonlight. They also toured New England, including Hyde Park, Walden Pond, Harvard, Yale, and Williams College, always seeing friends along the way. Seven years later, in 1968-1969, Ed and Jean they returned, with Carolyn (age 11) and Kim (6) for another year of Ed’s study at Union. The City was still full of wonders and opportunities. Plus it was a fascinating and volatile time politically. The family lived in Van Deusen Hall, a tall apartment building on Riverside at 122nd St, near Grant’s Tomb, Union, Columbia University, and Harlem. They shopped at the food co-op, attended baseball games, concerts, the World’s Fair, and explored the city and the region with enthusiasm. A favorite restaurant was Paddy’s Clam Chowder near Macy’s. 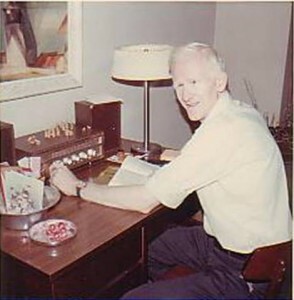 Ed’s new radio let him tune in to the stories of New York City, 1968. This was another mystical, magical year. Though Ed and Jean dearly loved Wake Forest, Jean remembers that the years in the City were a wonderful time that felt free of responsibilities and expectations. Ed and Jean both came to love New Yorkers, too, finding them almost always to be helpful and kind in their own way. One memory stands out. During the fall of 1968, Ed’s mother became ill and died. Returning from her funeral, Ed began his work as executor of her estate, paying bills and taking care of business. On a winter afternoon, he had written checks and signed documents in about twenty-five letters, sealed the envelopes, and dropped them into the mailbox on the corner of Broadway and 124th St.
Ed remembered saying, when the postman comes at 4:30, I’ll be waiting at the mailbox with the stamps. When the postman arrived, Ed cut to the chase, “There are 25 letters on top that need stamps. I’ve got the stamps.” The postman even helped Ed stamp the letters. Ed remembers, “Never said a word… I can still see his young handsome face.” His was the face of New York for Ed and Jean’s extraordinary time. Ed loved New York so much that for many years he organized student trips to share the magic of the Big Apple. These trips included a set called the New York Seminar, were offered between semesters or during spring break. They were often supported by Campus Ministry and co-directed by Jake Viverette. Ed also traveled to New York for conferences. One of these conference trips to the Big Apple is described is described in a November 1978 Jots and Tittles essay which appears under Sermons and Writings. 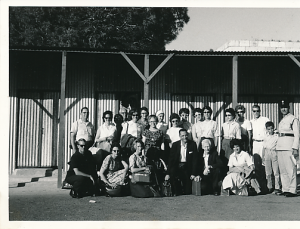 In the summer of 1963, Jack Noffsinger and Ed Christman, with two other chaperones, led a group of eighteen Wake Forest students on a trip to the Baptist Youth World Conference in Beiruit, Lebanon, and to many other countries along the way. This trip allowed the Wake Forest students to be among 3,000 student delegates from around the world. “Dr Jack,” then pastor of Knollwood Baptist Church, organized the trip with the International Auto and Travel Club, a Charlotte-based travel agency. The trip started June 24 and ended on August 4, with stops in England, Europe, the Middle East, and Egypt. Jack Noffsinger was tall, dark and handsome, just a little older than Ed. Early in his career, he had been nicknamed the “Cary Grant of Southern Baptists” for his movie-star good lucks. Dr. Jack had a strong interest in campus ministry and loved preaching to students. Jean had seen him preach at Ridgecrest when she was in junior college. At the time of this trip, he was a prominent, liberal Winston-Salem pastor and advocate for civil rights. The trip started with Ed and Jack riding the bus to New York City, where they met the group. The trip itinerary took them to London, Stratford, Paris, Geneva, Zermatt, the Matterhorn, Milan and Rome, Tel Aviv, Jerusalem, Beiruit, then Cairo, Luxor, Memphis, Pyramids, Athens, Vienna, Berlin, East Berlin, Copenhagen, Amsterdam, and then New York and home. Each stop incorporated visits to historical and spiritual sites; museums; theater, ballet and other arts events; bus tours; and time to explore. Jack wrote excellent travel notes and commented often on the congeniality of the group and the joy they had together, along with thanks for prayers from home to keep the itinerary running smoothly! Ed Christman and Jack Noffsinger, front center, with the Wake Forest student group visiting Europe and the Middle East in 1963. The Baptist Youth Conference brought together delegates from 58 countries for preaching, programs, music, discussion groups, and informal time. The speakers were international, and many African and African-Americans were featured prominently. Among them was Dr. Emmanuel Dahunsi of Nigeria who had a Th.D. from Southern Seminary in Louisville and was then a pastor in Lagos, and Bill Lawson, a pastor from Houston, Texas, who gave the closing message as a stand-in for Martin Luther King and was, according to Jack, “terrific.” Other pastors and lecturers were from Russia, Ceylon, India, Jamaica who gave the U.S. delegates a chance to reflect on the role of the church in a complicated world. They also made an excellent team and improvised well as needed. For example, late in the trip, on the flight from Luxor to Cairo, it happened that the flight crew spilled a pot of coffee on the plane, so much that it went streaming along the floor of the passenger section. As it turned out, upon arrival at the hotel, one of the WF students reported that the clothing in her luggage had been damaged by the coffee, which had dripped through cracks in the floor into the luggage compartment. It was Ed on the phone at 2am trying to explain the problem to the United Arab Airlines official and working with the tour officials to provide cleaning. While Ed was off on this adventure, he wrote to Jean every day about the adventures he’d had, using the blue lightweight air-mail letters. Jean was at home caring for Carolyn, who was then 6, and Kim, who was 1. They spent some of the time in Winston-Salem and then went to Hopkinsville, Kentucky, with help driving from Margaret Blackburn. Jean, Carolyn and Kim spent the rest of the summer with Jean’s mother Emma Sholar for a weeks-long vacation of their own. When Ed got back to the United States, he flew from New York to Nashville, Tennessee, and they reunited for the drive home to Winston-Salem. Ed and Jean traveled to many interesting places to participate in the Baptist Peace Fellowship Conferences. Photo by Kim Christman. Ed and Jean, with daughter Kim and son-in-law Stan Dotson, were members of the Baptist Peace Fellowship of North America. They spent many vacations attending the annual BPFNA summer conference — known affectionately by its regular attendees as “Peace Camp” which was convened in cities across Canada and the United States. Stan Dotson: “The conference trips became a wonderful way to stay connected to friends across the country and to stay engaged in the work for peace and justice. They were also a great way to site-see in many unique communities in North America. Canadian sites included the capital of Ottowa, during a week when the queen was visiting; and Nova Scotia, with a side trip to Prince Edward Island for a tour of the house that inspired Anne of Green Gables and a sampling of Cow’s Ice Cream, the best in the world. U.S. conference sites included a trip to the Finger Lakes region of New York and the Bay area of California. 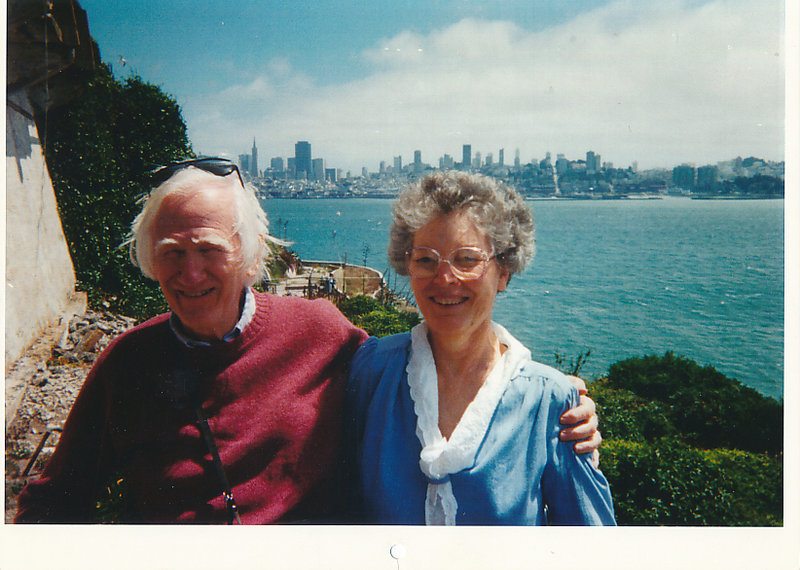 “The world of art has always played an important role in Ed and Jean’s life, and many of these trips included excursions to see beautiful works of art. The California trip included a ride to the Stanford University campus to see the stained glass of the chapel and the Rodin sculptures on the campus quad. A Peace Camp in British Columbia included a ferry ride over to Vancouver Island to view the incredible floral displays of Butchart Gardens. 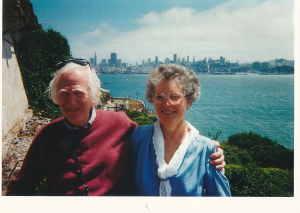 “The BPFNA always had world-class scholars and teachers and preachers facilitating the programs, giving Ed and Jean opportunities to connect with people doing amazing work for peace around the world. But the conference planners also recognized that there were amazing peacemakers among the organization’s own members, so Friday night was always set aside an “open mike” opportunity for story-telling and sharing from the attendees. It became a great tradition during this segment of the week’s programming for Ed to stand up and make his way to the mike sometime during the evening. Each year the regulars of the conference looked forward to some compelling and often humorous story he would tell from his rich experience as a peacemaking chaplain.